The tamponade effect of the injected material results in ischemia. The ischemia and direct toxic effect of the injected substance appear to be responsible for the pathogenesis of the injury. Several factors determine the severity of the injury. The type and amount of injected material seem to be the most important factors determining the severity of the injury. Other factors are the injection velocity (kinetic energy), time period between injection and treatment, and whether synovial sheaths have been penetrated. The flexor sheaths of the thumb and small finger extend into the radial and ulnar bursae, respectively, and may allow the injected material to reach the forearm. Paint thinner dissolves lipids even when not under high pressure, which causes tissue necrosis. Oil-based paints cause more injury than latex-based paints. Other common injection sites are the long finger, thumb, and palm. The patient typically presents with an asymptomatic benign-appearing puncture wound at the injection site, and may delay seeking treatment. This may be accompanied by pallor, edema, and anesthesia, progressing to severe tenderness on palpation and gangrene if untreated, depending upon the chemical injected. Radiographic evaluation may reveal subcutaneous emphysema, paint, or both within the soft tissues. High-pressure injection of paint into a digit. Exploration revealed paint injection limited to the distal half of the digit. The wound from a high pressure injection injury may appear deceptively benign, as the small puncture wound in this patient shows. Prompt recognition of the injury and aggressive early treatment are essential to avoid a poor outcome. [2, 3, 6] Tetanus toxoid should be administered if not up to date. The extensive amount of soft tissue necrosis resulting from the injury creates an environment that encourages the growth of bacteria. Prophylactic broad-spectrum antibiotics should therefore be administered. Pinto et al reported that 15 of 25 patients had infection confirmed by cultures, and growth of Staphylococcus epidermidis was noted in 10 of 25 patients. Five injuries were polymicrobial. All necrotic tissue and injected material should be debrided. Surgical treatment should ideally be carried out within 6-10 hours of the injury. The wound should be irrigated copiously with normal saline solution under general anesthesia or axillary block and then packed open. Preservation of vital structures such as nerves, vessels, and tendons that may be infiltrated can be conservative initially until they declare themselves. The packing can be removed in 24 hours, and the wound debrided again if necrotic tissue remains. Fujitani et al described the case of a man with a dorsal hand wound caused by high-pressure oil injection who was successfully treated with negative-pressure wound therapy and application of a surgical glove. These were used to decrease swelling and manage wound exudate, with the investigators finding that swelling was reduced and that granulation tissue developed. For more information on wound management, see Medscape's Wound Management Resource Center. The use of steroids in these injuries is controversial. Based on their own results, Lewis et al recommend the use of steroids with antibiotics in all patients except for those with grease gun injuries with minimal tissue extension. Conversely, Jebson et al do not use steroids routinely,  whereas Pinto et al believe steroids are contraindicated because they depress the leukocyte response. In a literature review of 435 cases over 37 years, Hogan and Ruland found that steroid administration did not impact the amputation rate or incidence of infection. Range-of-motion exercises are begun early in the postoperative period to avoid a stiff digit or hand. This aggressive approach can be modified for air and clean water injection injuries. Air injection injuries may be treated by the administration of broad-spectrum intravenous antibiotics, splinting, and elevation. Clean water injection injuries require superficial debridement (which can be performed under local anesthesia), broad-spectrum antibiotics, and elevation. In either situation, close observation is necessary, and modification to the aggressive surgical approach previously described is instituted if indicated. Reconstruction with skin grafts or local flaps may be necessary. The final outcome must be guarded, especially when the injected material is a toxic chemical. Even if the digit survives, it usually results in a painful, stiff, atrophic digit. In a long-term follow-up prospective study, Wieder et al  found that the main complaints were cold intolerance, hypersensitivity, paresthesias, and constant pain. The stiff symptomatic digit may be more of a hindrance than of functional or aesthetic use. In such cases, amputation may be the best course of treatment. 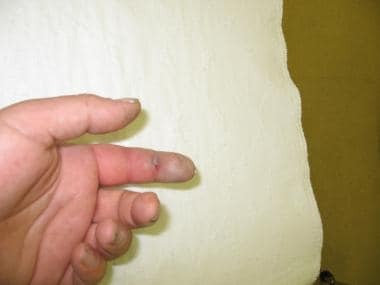 Patients with these injuries must be informed and prepared for a poor outcome, including eventual amputation of the involved digit. Bekler H, Gokce A, Beyzadeoglu T, Parmaksizoglu F. The surgical treatment and outcomes of high-pressure injection injuries of the hand. J Hand Surg Eur Vol. 2007 Aug. 32(4):394-9. [Medline]. Jebson PJ, Sanderson M, Rao VK, Engber WD. High-pressure injection injuries of the hand. Wis Med J. 1993 Jan. 92(1):13-6. [Medline]. Pai CH, Wei DC, Hou SP. High-pressure injection injuries of the hand. J Trauma. 1991 Jan. 31(1):110-2. [Medline]. Schoo MJ, Scott FA, Boswick JA Jr. High-pressure injection injuries of the hand. J Trauma. 1980 Mar. 20(3):229-38. [Medline]. Lewis HG, Clarke P, Kneafsey B, Brennen MD. A 10-year review of high-pressure injection injuries to the hand. J Hand Surg [Br]. 1998 Aug. 23(4):479-81. [Medline]. Eroglu O, Sari E, Vural S, Coskun F. Warning: This may be as dangerous as firearm injuries;"grease-gun injury": A case report. Pan Afr Med J. 2015. 20:40. [Medline]. [Full Text]. Pinto MR, Turkula-Pinto LD, Cooney WP, et al. High-pressure injection injuries of the hand: review of 25 patients managed by open wound technique. J Hand Surg [Am]. 1993 Jan. 18(1):125-30. [Medline]. Fujitani T, Zenke Y, Shinone M, Menuki K, Fukumoto K, Sakai A. Negative Pressure Wound Therapy with Surgical Gloves to Repair Soft Tissue Defects in Hands. J UOEH. 2015 Sep 1. 37 (3):185-90. [Medline]. [Full Text]. Schnall SB, Mirzayan R. High-pressure injection injuries to the hand. Hand Clin. 1999 May. 15(2):245-8, viii. [Medline]. Hogan CJ, Ruland RT. High-pressure injection injuries to the upper extremity: a review of the literature. J Orthop Trauma. July 2006. 20(7):503-511. Snarski JT, Birkhahn RH. Non-operative management of a high-pressure water injection injury to the hand. CJEM. 2005 Mar. 7(2):124-6. [Medline]. Peters W. High-pressure injection injuries. Can J Surg. 1991 Oct. 34(5):511-3. [Medline]. Wieder A, Lapid O, Plakht Y, Sagi A. Long-term follow-up of high-pressure injection injuries to the hand. Plast Reconstr Surg. 2006 Jan. 117(1):186-9. [Medline]. Verhoeven, N., Hierner, R. High-pressure injection injury of the hand: an often underestimated trauma: case report with study of the literature. Strategies Trauma Limb Reconstr. April, 2008. 3(1):27-33. [Full Text].